Good morning. Thank you for inviting me to attend this roundtable dialogue. 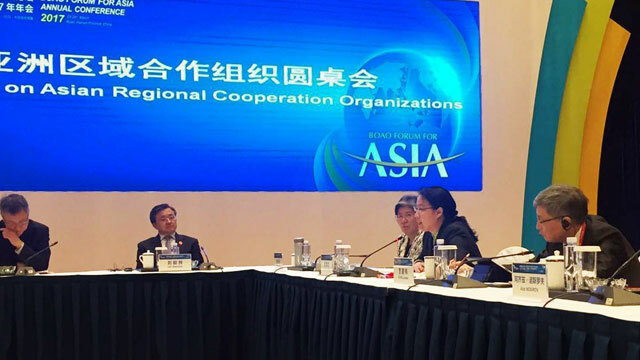 As Director of AMRO, the regional surveillance organization in the ASEAN+3 region comprising the ten ASEAN countries plus China (including Hong Kong), Japan and Korea, I am honored to have this opportunity to introduce my organization and to share my views on Asian regional cooperation at this roundtable. AMRO was established to contribute to the macroeconomic and financial stability of the ASEAN+3 region through conducting macroeconomic surveillance and supporting the implementation of the regional financial arrangement, namely the Chiang Mai Initiative Multilateralization or CMIM. The CMIM came into existence in 2010, with two main objectives: to serve as a regional self-help mechanism to address balance of payments and/or short-term US dollar liquidity difficulties in the ASEAN+3 region; and to supplement existing international financial arrangements. The CMIM was upgraded in 2014 to include a crisis prevention facility, and its size was doubled to US$240 billion. The ASEAN+3 authorities share the understanding that independent regional surveillance is the key for such a self-help mechanism to work. AMRO was set up to provide that function, of conducting macroeconomic surveillance during peacetime and to provide the assessments and policy recommendations that are needed in order for the CMIM to operate successfully. Initially established as a company in Singapore in 2011, AMRO was transformed into an international organization with full legal personality, effective from 9 February 2016. AMRO’s vision is to be an independent, credible and professional regional organization acting as a trusted policy advisor to our members in the ASEAN+3 region. AMRO is a product of regional cooperation, and will continue to be one of the “anchors” to advocate for regional integration. The ASEAN+3 region has reaped tremendous benefits from regional integration while at the same time, remaining open to the rest of the world – in what I would call “regional multilateralism”. It is noticeable that the region has achieved a lot, in the past two decades after the Asian Financial Crisis (AFC), by successfully adjusting its growth model, from export-oriented to more domestic demand based, to benefit from global trade and investment flows while riding on the tide of regional integration. The ASEAN+3 region has expanded to become the largest economic block in the world, accounting for more than a quarter (26%) of world GDP in 2015 (at market exchange rates). The ASEAN+3 region has become the fastest growing area in the world since early 2000s. Even after the Global Financial Crisis (GFC), the region continued to annually grow around 4% in 2011-2015, and according to AMRO’s estimate and baseline scenario forecast, grew at 5.3% in 2016, and will grow at 5.2% in 2017. On the trade side, the region accounts for almost 30% of global trade, almost double from its share during the AFC. The region’s openness to trade – the ratio of merchandise trade to GDP – amounts to nearly 50% in 2015, up from 37% in 1998. The region has also contributed substantially to global demand and growth, especially in the past five years after the GFC. The post-GFC period witnessed the region’s extraordinary contributions to world GDP growth, around 50%. Intra-regional trade accounts for almost 47%, half of total trade for ASEAN+3 economies, and reflects the formation of global value chains oriented to meeting demand from both outside and within the region. Intra-regional foreign direct investment or FDI flows have risen strongly in recent years. The plus-3 economies – China including Hong Kong, Japan and Korea – together accounted for 30 percent for total FDI inflows into the ASEAN economies. The global policy landscape, however, is now at risk of a major policy shift to greater bilateralism approach towards trade and potentially other economic relations. Led by the U.S., this bilateral approach challenges the modality of and benefits from multilateral economic cooperation. In the current uncertain global environment, policymakers’ affirmation of their commitment to regional economic and financial cooperation would help anchor market expectations and provide a solid policy basis for the region’s continued growth and development. First, the ASEAN Plus Three Leaders’ Summit in 2017 is expected to deliver a clear and strong message to the world on the need to uphold regional multilateralism, and the benefits that this brings. This strong collective message from our political leaders would be essential to counter the tide of rising trade protectionism and bilateralism. Second, the ASEAN+3 region as a whole and also through individual countries’ efforts should adopt and implement concrete measures to promote multilateral and intra-regional trade and investment flows. Examples include swap arrangements between central banks in the region in local currencies to facilitate trade settlement, implementing commitments in trade agreements to reduce non-tariff barriers, as well as expediting the negotiation process of the RCEP. Third, the ASEAN+3 region should continue its strong efforts and commitment to building a robust regional financial safety net. With the increasing volatility in financial flows and risks from contagion, it is no longer enough for a single economy to build up its foreign exchange buffer against external shocks. Following the Global Financial Crisis of 2008, the international community led by the G20 has made it a top priority to build a robust multi-layered Global Financial Safety Net to support the international financial system. A robust regional safety net in the ASEAN+3, in the form of the CMIM, would constitute an integral part of the Global Financial Safety Net. While progress has been made, there is still much work to be done in integrating these various levels of safety nets. AMRO, in our support of the CMIM, remains committed to building a robust and operational regional safety net, so as to help secure economic and financial stability in our region and contribute to the stability of the global financial system.